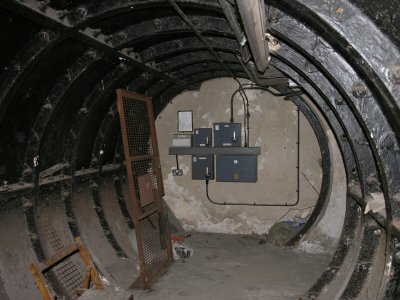 All eight Deep Level shelters built during 1941-1942 under existing London Underground stations remained under the ownership of the British Government for many years after the cessation of hostilities. The initial plan of incorporating them into an express rail route through the centre of London was initially shelved and then abandoned due to the lack of money after the War. Then, in the late 1990s, London Underground was given the opportunity to take control of the shelters with a view to leasing them out. 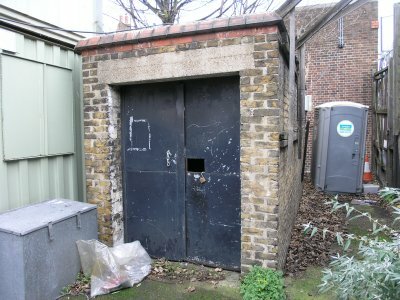 Since then, the deep level shelters (such as the one visited in Belsize Park in 2004) have been progressively leased to companies interested in using them to store items such as documents, film, videotapes and other similar archive material. All except Clapham North, which has remained completely empty since its contents were cleared after the War. Until now. 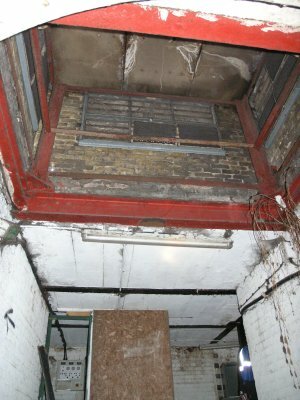 In 2006, Transport for London advertised the lease for Clapham North deep level shelter using a local estate agent and the requests came in. 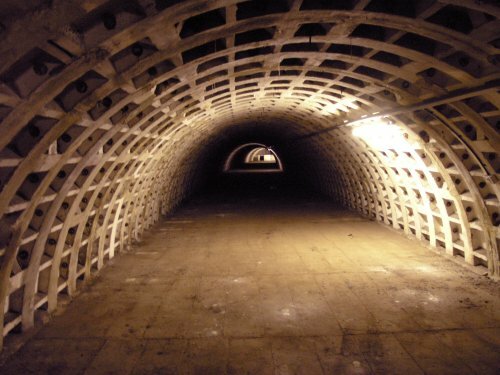 Many interesting and unusual requests for use were suggested but had to be rejected for health and safety reasons - the most common being people wanting to construct a night club in the 1,400ft tunnels! Some suggested creating living accommodation there - though precisely who would like to live in an unlit tunnel over 100ft beneath London is unclear to me. It was even rumoured that a large entertainment company had seriously looked into the possibility of converting one of these locations into a theme park ride based on World War 2 air raids! Realistically though, the only practical use for this prime central London real estate space would be for storage. Shortly before such a lease was signed and the space became primarily accessible only to the leaseholders, a small group visit was permitted and led by two experts from London Underground and myself for Clapham Society, a local civic amenity society, working to protect the environment and to strengthen local identity and sense of community. Our visit was to start outside the familiar looking concrete blockhouse structure that provides the entrance to the shelter. 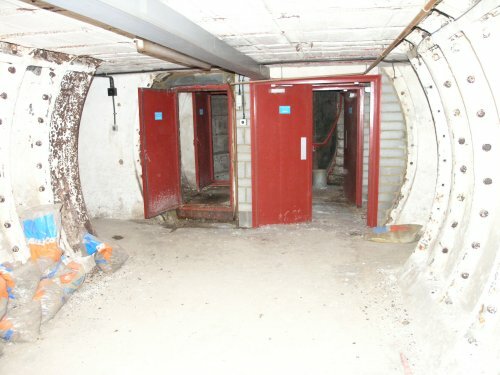 This building looked very similar to other similar structures, which provide access to some of the other deep level shelters under other London Underground stations. Our contact with London Underground duly arrived and to our horror, we quickly discovered that someone had changed the locks and none of the keys were able to open the locked gate and probably all the doors beyond! My heart sank as I had travelled from South Wales to London specifically for this visit and had even taken a day off work for this purpose! After a quick think, our guide quickly realised that Clapham North station staff regularly used the yard behind the station where the shelter's second entrance was located and we walked the short distance there in the hope that the lock on the shelter door hadn't been changed. In the end this initial problem turned out to be a real boon as this entrance is unique in its construction when compared to all the other deep level shelters in that it doesn't have the familiar round block-house structure on the surface. 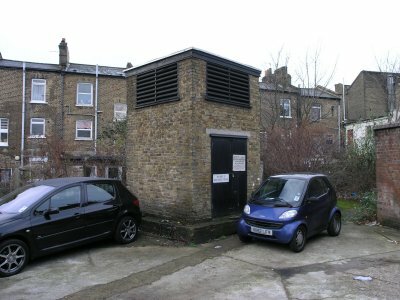 Rather, there was a collection of three small squat structures that provided the site's ventilation and entrance. We would have seen none of this if things had worked out to plan. As we entered the yard, immediately in front of us we could see a short tower that was originally used as part of the site's ventilation system. Written on this tower on a weather worn wooden sign was a sign from the Ministry of Public Building and Works. 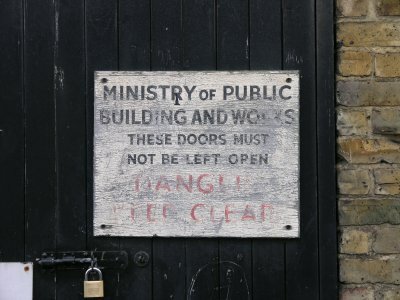 This was not an original World War 2 sign; the Ministry of Public Building and Works came from the earlier Ministry of Works, which was formed in 1943 to orgnaise the requisition of property for Wartime use. It was renamed the Ministry of Public Building and Works in 1963 and then became part of the Department of the Environment in 1970. It is highly likely therefore that this sign dates back to the mid 1960s. 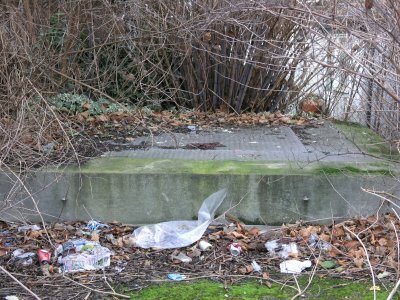 Immediately to the rear of this small building was a large round "manhole" cover over a square concrete block. This actually covered the site's main ventilation shaft and ran vertically down to shelter level. 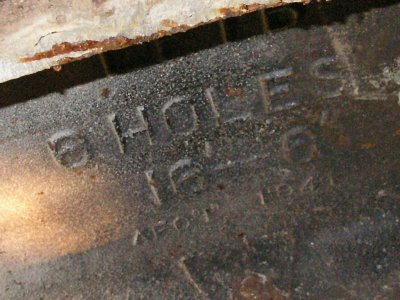 It was in fact an exit vent - when the shelter was in operation, waste air would have been pumped up this shaft (using powerful air pumps situated on the shelter level) and fresh air was allowed to flow down the two main entrance shafts. Originally this shaft would have had a short tower constructed above it so that air exiting the shelter wouldn't have mixed with air being sucked in, but this was now long gone. Not far from this there was a second structure of similar design to the first squat building, with some slats in its roof - obviously for ventilation. 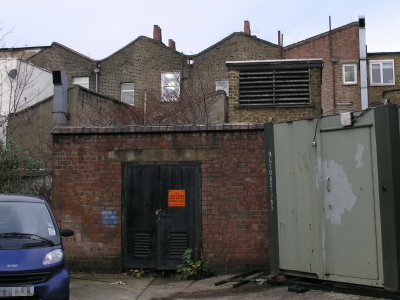 Initially, I thought this would be the site's main entrance but it turned out that the small door in front of the roof with slats was only a storage room that originally contained some plant, probably something to do with the shelter's original emergency power supply. It turned out that the site's entrance was actually immediately to our right as we entered the yard, which also contained several portacabins and a portaloo, installed there when the main Underground station was being refurbished. 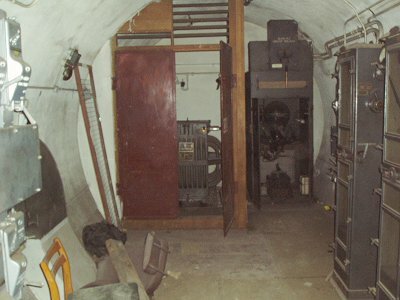 Once opened, a short corridor led into a small, unlit entrance lobby and then the descent into the shelter's bowels began! 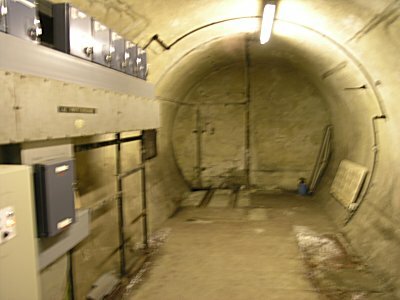 As mentioned previously, most of the deep level shelter spiral staircases start in the concrete pillbox building above surface, which also acted as protection from being struck by a bomb. 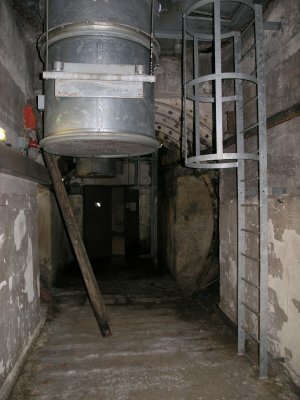 The round pillbox contains the lift machinery and the top of the double-helix spiral staircase down to shelter level. This entrance however turned out to be quite different. 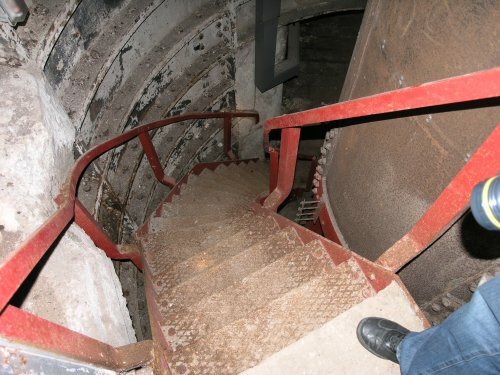 The initial descent was to be down two flights of a wide staircase down a tubular tunnel. Originally, this staircase would have been well lit, but in our case, all the lights were off and in most cases had been removed - in fact, the entire descent to the shelter levels would take place only under the light of our own lamps. I assume this staircase served a similar purpose to the blockhouse in that only a direct hit by a bomb would provide any threat to the shelter below. As we descended the staircase, some light could be seen filtering in through the roof. Looking up, the slats of the ventilation structure we'd seen from the courtyard could be seen, this time from the inside. Covering these slats, the remnants of a series of filters could be observed. 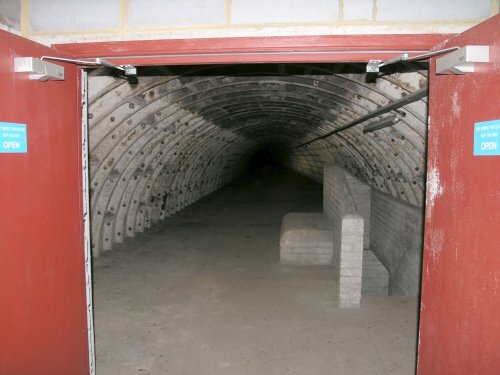 During the shelter's use as an air raid, these filters would have prevented dust and fine debris from bomb damage entering the shelter's ventilation circuit during the blitz. Some of these filters had since fallen down and were lying to one side of the staircase. Initially, I had hoped that these were a remnant of the original filters, but this hope was quickly dashed on inspection - each of the fallen filters had an "01" London STD dialling code on the fax number of the company that manufactured them... although old, not nearly old enough to be artefacts from World War 2. 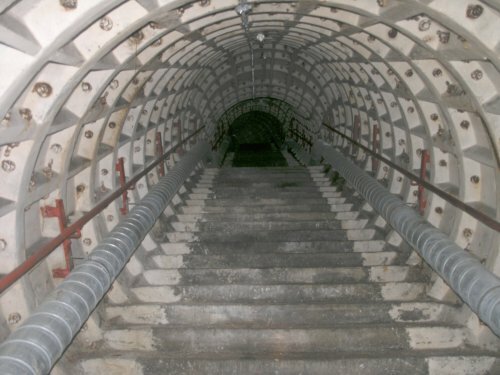 At the bottom of this wide staircase, the tunnel effectively became a T-junction, diverting into into two narrow corridors, 90 degrees to our left and to our right. These corridors quickly doubled back on themselves and entered into a tight spiral staircase. The left passage led to the staircase to the top deck of the shelter while the right led to the bottom - a double helix spiral staircase with two staircases in one shaft, 180 degrees out of phase with each other.. In the centre of the spiral staircase was a void, encased in a metal mesh, which would have originally been occupied by a lift. This was not predominantly designed to provide passenger access to the shelter; rather it was to provide goods and provisions for the shelter's canteen and other provisions. It was a lengthy climb down. Apparently the shelter is 4 storeys lower than Clapham North station. 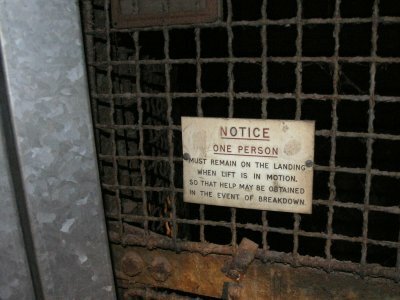 We were told that the shaft we were initially intending to descend had 176 steps. This one had a few less because of the generous initial staircase, nevertheless, it still felt like a long way down! The dimly lit view of the crossover passage at the bottom of the spiral staircase. The bright light is coming from the corridor to the women's toilet and the two main shelter tunnels with their doors open can be seen further down. Note: This image is out of sequence and actually shows the crossover on the bottom shelter deck in exactly the same location and direction. The top deck is similar but has a curved roof as is seen in the next image. Once at the bottom we found ourselves in a relatively wide cross-tunnel, which linked the spiral staircase to the two 1400 foot long shelter tunnels. This cross-tunnel has an interesting construction design. 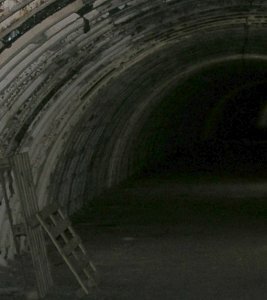 although we knew that we were in the top level of the shelter, the tunnel we were standing in looked strange, considering it was supposed to be a two level tunnel. 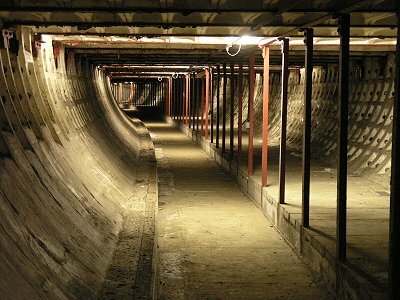 In fact, it was almost unique in design and the first time such a tunnel had ever been built using this form. Essentially it took the form of a figure 8 - two bisecting circular tunnels had been mined to form the top and bottom level of the shelter in order to provide more space. As we walked the regular noise of trains passing through Clapham North station four stories above out heads could clearly be heard - this just added to the surreal atmosphere that exhudeds this location. In fact, this sound was regularly heard throughout our visit, a reminder of the fact that this location could so easily have become a part of the Underground network had things happened differently. Before reaching the main shelter tunnels, two short tunnels branched to our right. The first one branched off to what would have been the shelter's men's toilets and the second went to the women's toilets. 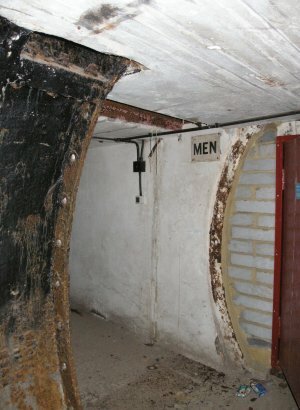 All fixtures and fittings had since been removed but the location of where the urinals had been could be clearly on the walls, as could the blocked off drainage pipes and marks in the walls where the stall walls had once stood. 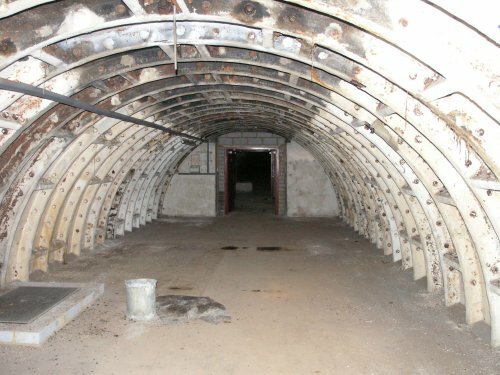 Once we'd investigated these, we then carried on towards the main shelter tunnels. As we walked down this tunnel, thin straw like stalactites could be seen, some more than 2 feet in length, where minerals in the rocks outside the shell of the structure had leaked through over the years, depositing formations not dissimilar to those seen in caves. These were hollow and most had a drip of water waiting to drop from their ends. As well as the stalactites, very short but stubby stalagmites could be seen forming on the floor. People walking through the tunnels have probably worn some of these down over the years, but some bore an uncanny resemblance to features more commonly observed in show caves. 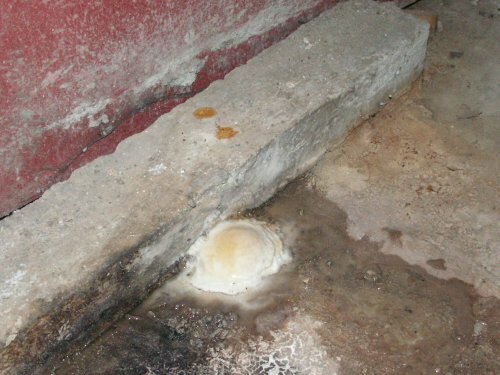 Stalagmite formation, resembling a fried egg! At the first shelter tunnel we came to, the tunnel to the right was in complete darkness as it ran way into the distance. Even with a powerful lamp it was impossible to see the end of this tunnel, such was its length and in the distance it could be seen to curve to the right. Northbound, eastern, top deck passageway, unlit apart from feeble torch lamps and camera flash. Note the small emergency staircase down to the bottom deck. 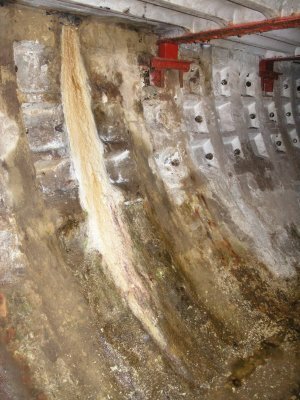 This main tunnel was clearly different in construction from the interconnection tunnel. It was clearly a circular tunnel with the floor effectively bisecting the circle in its diameter. A small concrete staircase ahead of us could be seen leading down to the bottom level of the shelter. Practically, these would not have been in use by the shelterers. Each person using the shelter would have been assigned an entrance, level and location within the shelter. The concrete stairs are there mainly to provide emergency access and also for the wardens and administrators to manage the location. 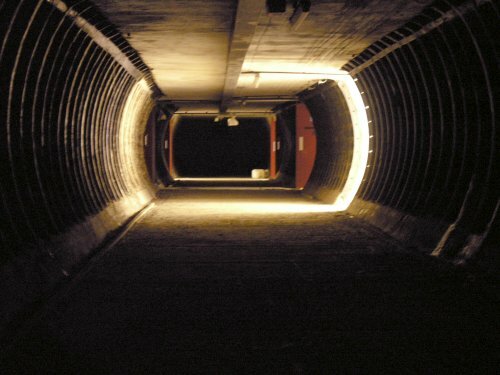 The tunnel to our left however was dimly lit - about 1 in every four of the strip lights that had been installed were working, giving an eerie illumination to the location. Southbound, tunnel, with some boxes for experimentation. 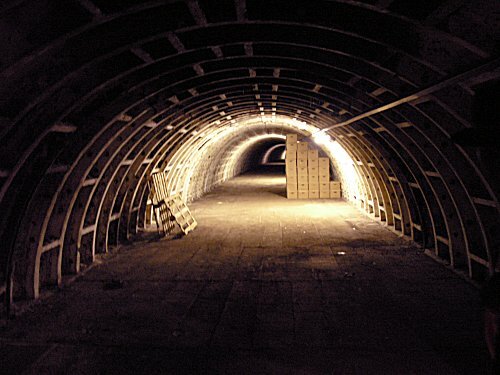 In this tunnel a small pile of cardboard boxes stacked against one of the walls could be spied and some pallets were stacked against the opposite wall. This, we were told, was an experiment in stacking by the future lease holders to see how many boxes could physically be stored in the tunnels. At this point we could see the two modes of construction employed in this subterranean structure. Initially we had been walking through a tube made of cast iron rings. However, as we continued walking, the tunnel walls turned into concrete rings. Apparently the original intention was to use concrete throughout, but the time required to make the pre-cast concrete rings was prohibitive, so a combination of both methods eventually was used. This upper section took an open, semi-circular form. The floor was a metal mezzanine and the circular rings of the iron/concrete walls seemed to spiral into the distance. 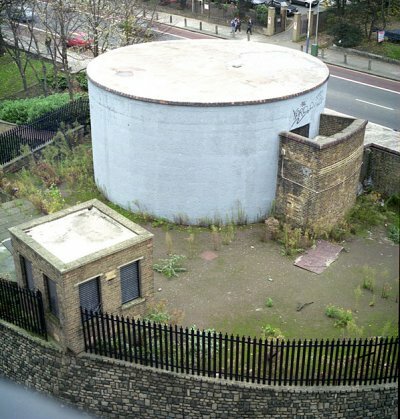 When the shelter was in use, the top of this tunnel would in fact have appeared flat. 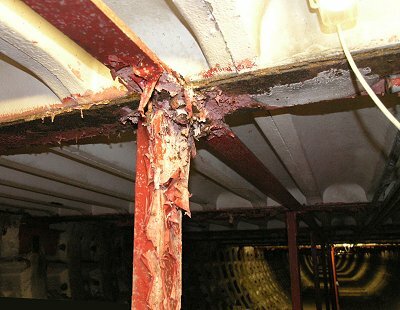 This is because there would have been a foul air duct running along the entire roof of the tunnel to allow waste air to exit. Nothing now remained of this duct throughout the complex apart from occasional short support struts. We then walked down to the end of this tunnel - about 100 yards, avoiding some of the stalactites along the way. When we reached the end there was a small staircase leading to a small void beyond, which acted as an intersection between both levels of each tunnel and also between the two shelter tunnels - this is one of the few places where all four of the tunnel levels interconnected. Again, regular shelterers wouldn't have had access to this area. This was again predominantly for emergencies and administration. Once a group photograph had been taken here, we then went into this intersection. We walked over to the second shelter tunnel and down to the lower deck. Once out in the lower level, it became apparent that this lower level looked quite different from the top section. We were now in the bottom half of the circular section of the tunnel. 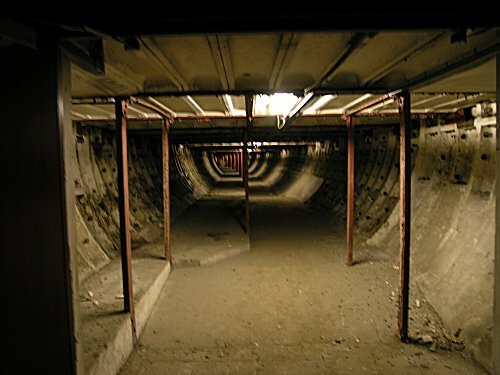 Because the flat mezzanine structure that divided the two levels needed support, there were regular posts along the tunnel length to provide this support. The floor of the upper level was the flat mezzanine platform. The bottom level didn't have this luxury and had to have a flat floor built otherwise we'd have to negotiate the concrete and iron rings in our walk. This made the space between roof and floor noticeably lower. One side of the tunnel was noticeably higher than the other. 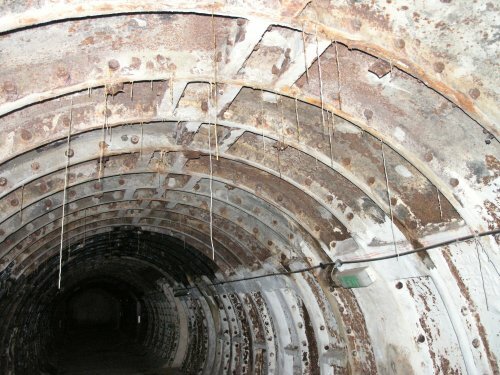 This is because, unlike the upper level, the waste air duct remained in place, and ran the length of the tunnels to one side, giving a lopsided appearance to the lower deck. Walking along this tunnel, several in the group commented on the eerie imprisoned feeling it gave. This I suspect was the perception of endless bars running into the distance combined with the mild claustrophobia caused by the low roof. On this level, bunks would have been arranged to allow for maximum capacity in the available confined space. 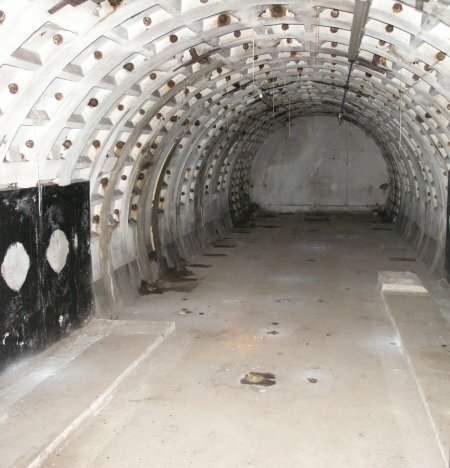 To the left, above the waste air duct, the bunks would have been arranged perpendicular to the tunnel wall, providing three levels of sleeping. 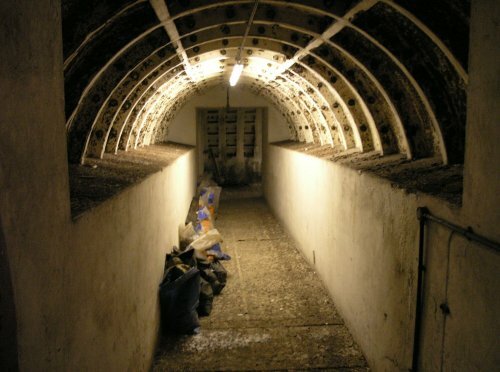 To the right, where there wasn't so much space, the bunks would have been arranged in parallel with the tunnel wall, again providing three bunks per bedding area. We continued walking down this strange tunnel until we reached the crossover passage that led back to the spiral stair case with the toilet blocks. These, we could see had been duplicated here on the lower level. Before continuing on, we noticed that the crossover passage seemed to continue on past the two main shelter tunnels for a short distance. In this short section, medical stations would have been based. With 8000 people to care for, there would inevitably be the need for emergency medical aid. This area also formed administrative hubs for the various shelter sections. We continued walking down the lower tunnel. A distinct curve could be seen along its length, extenuated by the regular red metal pillars. This tunnel felt considerably drier than the upper level, it was also a lot dustier and a thin mist of dust formed as we walked. Despite appearing drier, the occasional mineral feature could still be observed on the walls and also the metal pillars along with their paintwork in places were starting to show their 60 odd years of disuse. After walking for some time we came across a concrete wall with a doorway. This had been provided to control the flow of air in the structure. Shortly after this wall, a small cross passage was seen, which had a wide stairway leading upwards from it, between the two shelter tunnels. This stairway didn't stop on the top deck. It continued on for four lengthy flights before ending with a brick wall. This in fact was the shelter's third entrance. 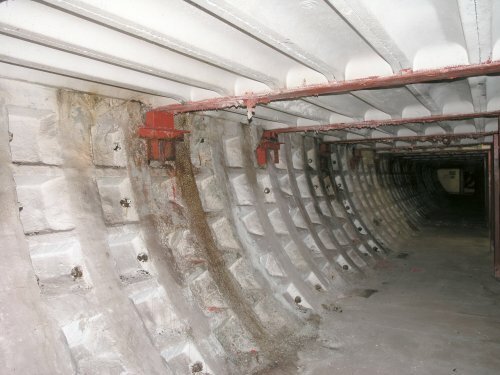 As well as the two "surface to shelter" spiral staircases, a third entrance was provided for each of the deep level shelters joint directly with the platform levels of their associated Underground stations. This would allow people from further a field to come to their designated shelter. Instead of risking a journey from the platform to surface and then back down again, these people were able to disembark their trains and proceed directly to the deep level shelter along the staircase in which we were standing. Today, the access with Clapham North station has been severed, hence the brick wall. 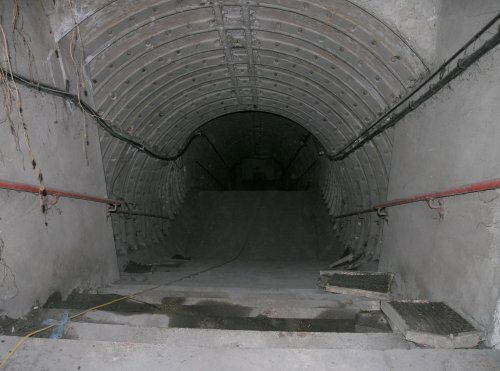 I understand that this tunnel would have originally come out nearby Clapham North's emergency spiral staircase. Unlike anywhere else in this shelter, the air in this staircase tunnel was dank and stale as there was no longer any means of circulating the air here. Two aluminium pipes ran down its side - apparently something to do with an attempt to provide some cooling for the Underground station above. Once we had spent some time looking at this staircase, we continued down the shelter tunnels, this time back up on the top deck as it was better lit. It wasn't long before we came across yet another wall with a doorway across the shelter tunnel. This turned out to be the crossover passage for the second spiral staircase that should originally have been our entrance into the complex. Here we saw all the features we'd seen in the first crossover duplicated; two sets of toilets (2 on each level) and the short overrun to provide room for the medical posts. although we were on the bottom level, a short length of spiral staircase appeared to continue downwards in the stair shaft. This was in fact the way to the complex's plant and control room where electricity, ventilation, water and sewage were managed and controlled. Today however, virtually everything had been removed. 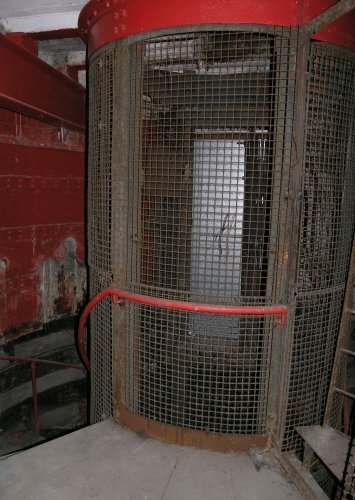 The compression system used to eject sewage from the nearby toilets had been dismantled and removed, as had the transformer and mercury arc rectifier that once powered the lift (though there were still marks on the walls and floor where they used to stand). Only some basic electrical controls remained on one wall. 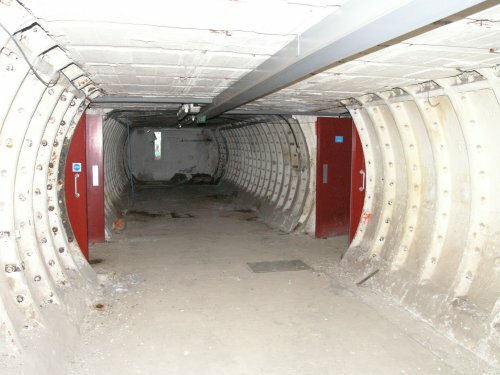 However, some of the ventilation ducts were still in place - two aluminium ducts came straight in through the roof with metal ladders accompanying each duct - the air ventilation system and its fans and pumps were presumably in the chamber above. These ducts looked suspiciously new - had they been replaced in the intervening years? We had reached the end of our tour. Shining our torches down the remaining unlit section of tunnelling, we could see the end of the shelter tunnel in the distance. Down there, there would be another cross-section similar to the one we had traversed earlier. As this was a duplication of what we had previously seen, it was time for us to make our way back to the fist stair shaft we had originally climbed down. 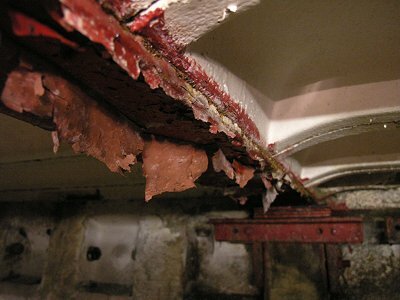 During the walk back, it was again noted how dry the bottom deck seemed - yet at times wet formations could be seen encroaching into the space where over the years, water containing disolved minerals had leaked in and deposited these minerals on the tunnel walls. The new tennants would probably have to do something about these leaks before placing documents here for storage. As we approached the spiral staircase, it was observed that the toilets on the lower level still had their gender designations. This is probably one of the only remaining signs left over from the original shelter construction found in the shelter area itself. Since we were entering the spiral staircase for the bottom deck, although we were climbing up in the same stair shaft, we were on a completely different staircase and emerged in the other short passage onto the wide staircase at the top of the spiral stairway. Along this staircase, some temporary lighting had been erected, now long abandoned. This was left from when some electrical modification work was conducted, probably in the 1990s. At the top of the spiral staircase we passed the original lift entrance, now blocked by a recently added aluminium plate. Next to the plate however, a sign was left over from when the lift was in operation, giving instructions on its use. An identical sign was observed in Belsize Park deep level shelter - another sign left over from when the shelter was constructed over 60 years ago. All that remained was to climb the wide staircase and we were in the small lobby area in the surface building and then out into the fresh London air on the surface. It was interesting to reflect on the fact that many of the tunnels that we had seen on that day would shortly be full once again. This time not with bunks and people sheltering from the bombs above, but probably filled to capacity with boxes full of the increasing amount of paperwork our "paper-less" society is generating requiring storage for many years to come. Note, this description is based on three separate visits that took place on 12th December 2006. Important note: London Underground/Transport for London do not, and can't provide tours of this location any more, either public or specially arranged private visits. The visit documented here was a special one-off, by invitation only as a part of a courtesy tour given to Clapham Society immediately before the complex was handed over to new tenants. Please don't ask me, or London Underground about visiting. Transport for London are no longer in a position to allow access to this location even if there is a legitimate requirement to do so. 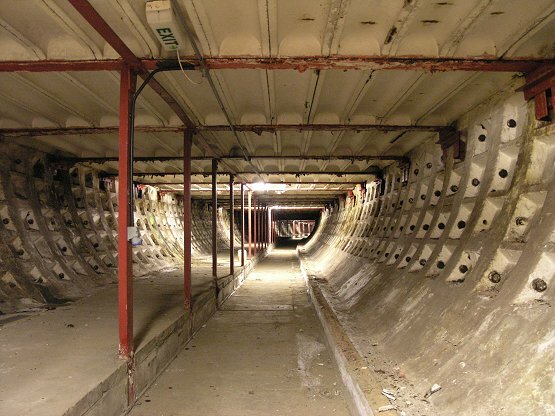 I currently have no details of who has leased the tunnels from London Underground and I suspect like some of the other companies that hire deep level shelter tunnels from TfL that they would also be disenclined to allow visitors due to the nature of their work. The tunnel outline diagrams were taken from 'Ministry of Home Security: Deep Tunel Air Raid Shelters: London 1942', a contemporary document about the tunnels. A copy of this document in its entirity can be found here. All material on this page, unless otherwise stated is © 2006, Hywel Williams, all rights reserved.